NPS: Trail conditions, Permit information, Permit availability, Bear canister requirements. To start at Roads End and hike clockwise obtain a permit for Copper Creek; if hiking counter-clockwise obtain a permit for Bubbs Creek. Tom Harrison Mt. Whitney High Country and Kings Canyon High Country maps at 1:63,360 scale, 3.5 oz total. National Geographic Trails Illustrated Map #25 Sequoia Kings Canyon National Parks at 1:80,000 scale, 3.3 oz. We have hiked many of the maintained and now-abandoned Sierra trails from Yosemite south through Sequoia National Park, including numerous east and west side trailheads. We’ve been over many class-2/3 passes, explored off-trail basins, and climbed quite a few class-2/3 peaks. We think this range of mountains is a superb place to go backpacking. Over the years, we’ve seen the John Muir Trail (JMT) get more crowded, and nearly all of the other trails get less use. The Big SEKI Loop (BSL) is a long on-trail hike for people to consider as an alternative to the JMT. While certainly not as well known as the JMT, the BSL has a number of advantages. The entire BSL is on maintained trails, just like the JMT. There are innumerable fantastic itineraries for people with off-trail skills and a copy of R.J. Secor’s The High Sierra Peaks, Passes and Trails, including Steve Roper’s Sierra High Route. Many people prefer to hike on maintained trails and a goal of the BSL is to provide a good JMT alternative. A major advantage of the BSL is that it starts and ends at the same place which significantly simplifies the logistics. The JMT is not a loop. 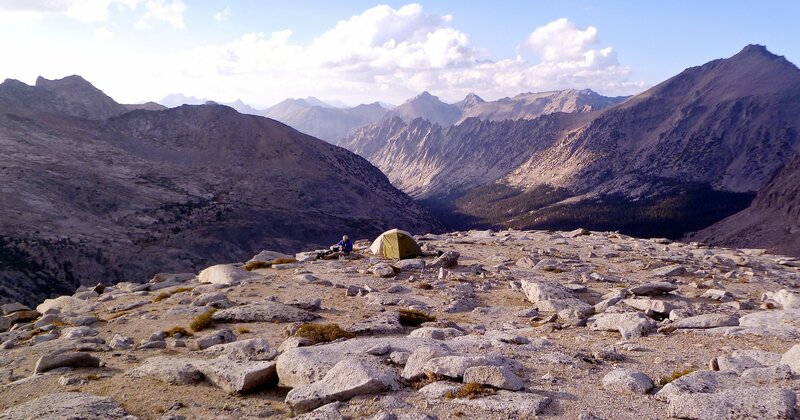 The High Sierra Trail, the other major named trail in the Sierra, gets you off the JMT and has good scenery, but is only 72 miles and is not a loop. The BSL does not require any resupply. Many lightweight backpackers can walk 13-22 miles per day on trail; that makes it 7-12 days to do this route. Assuming a base pack weight of 12 pounds, plus 1.5 pounds of food per person per day, starting pack weight would vary from 22.5 pounds for 7 days to 30 pounds for 12 days. Getting a permit to start the BSL at the Copper Creek Trailhead is not likely to be a challenge. Although permits may not always be available at the last moment, they should be easily obtained with a bit of advance planning. JMT permits are usually all taken the first day they become available. Everybody’s taste varies, but for us, the JMT includes stretches that are not the best the Sierra has to offer. The JMT from Happy Isles to Garnet Lake is beautiful, but can be easily explored via day hikes or weekend hikes using the ESTA and Yosemite buses for shuttling if necessary. From Garnet Lake to approximately Silver Pass through the Mammoth region, the JMT is not as scenic as the areas further north or south. From Silver Pass to Evolution Valley the JMT runs far to the west of very fine High Sierra terrain and misses a lot of the good stuff. Roper’s Sierra High Route fixes these problems with the JMT, but requires a lot of off-trail travel. A high percentage of the BSL travels through some of the best terrain the Sierra Nevada has to offer. 58 miles of the BSL is concurrent with the JMT and its associated crowds. We believe this concurrent section includes most of the best of the JMT, including crossing four of the five big passes. The rest of BSL is on lesser used trails where it’s possible to hike for long periods of time without seeing other people. The BSL also avoids the Mount Whitney scene. Whitney is the highest peak in the Sierra and has a trail, but also has a level of congestion and commotion that doesn’t suit everybody. Disclaimer: Do not rely on our exact tracks for your route; use skill and common sense. Our trail distance chart is based on the Trails Illustrated maps. Use the stated distances as guidance; various sources of trail distances rarely agree. We strongly recommend that anybody engaged in cross-country travel in the Sierra use RJ Secor’s book for more detailed route descriptions and difficulty levels. Sequoia National Park and Kings Canyon National Park are contiguous and jointly managed by the National Park Service. They are often called Sequoia Kings Canyon, or SEKI for short. SEKI and the adjacent USFS John Muir Wilderness is the most beautiful high country in the Sierra Nevada range. June: usually a lot of snow at high elevations. July: severe mosquitoes and great wildflowers. August: wildflowers and mosquitoes both in decline. September: no mosquitoes and few wildflowers. Autumn colors. October: transition season with possibility of winter storms dropping snow that does not melt the following day; back-country ranger stations are closed. We only travel deep in the SEKI backcountry in October when the weather forecast is all clear and then only for a few days at a time. Information describing when to hike the JMT applies to this route as well. There is a river crossing without a bridge across Palisade Creek where it meets the Middle Fork Kings. The crossing could be difficult in early season high water, although with adequate scouting people in prior years have been able to find logs to scurry across. The timing of the mosquito season is dependent on the snowpack. To determine how the snowpack compares to normal, go to the River Forecast Center, open the Snow Data section on the right panel, and check the box Current Day SWE % of Normal. Our general guideline is that the mosquito season ends sometime in August. If the spring snowpack is well below normal early August is safe. If the spring snowpack is well above normal mosquito swarms may persist until late August. There are two brands of maps listed in the Resources section: Tom Harrison and Trails Illustrated. Both brands are waterproof and cover the entire route including all emergency exit routes should they become necessary. The pair of Harrison maps have a slightly better scale but there is no overlap between the two maps so they is a little hard to use near the Keasarge Pass Trail junction. Either brand is adequate for this route and minor side-trips off route. Those planning to venture off trail should use CalTopo to print more detailed maps. We have a complete and annotated gear list in a series of articles. This gear serves us very well on all of our hikes, including the Big SEKI Loop. There’s a reasonable chance you’ll have no precipitation at all or you may get just a few short afternoon showers. On the other hand, the monsoonal weather pattern that feeds northwestern Mexico in late summer can misbehave and wander north into the southern Sierra. When that happens, it’s possible to get severe and prolonged storms. You must decide whether to take rain gear and shelter for what is likely, or what is possible. We have made a choice to always be prepared for what is possible. Some people hike in the Sierras prepared only for what they expect. You choose, but DON’T base your decision on ten trip reports or ten friends who said they had no rain. We have been in the Sierra backcountry twice during severe storms in which there were weather-related deaths and much SAR activity; we may have been in deep trouble if we had not had proper gear. With the currently changing jet-stream patterns, we may start to see more unusually strong summer monsoon storms coming up from the south, similar to the anomalous Ridiculously Resilient Ridges that have prevented normal winter storms from reaching California. The BSL does not cross any summits, but there are several fairly easy off-trail Class-2 peaks climbed by just a few people each year near the route. The CalTopo map show locations of some SPS peaks. Anybody who is planning off-trail travel is advised to get a copy of R.J. Secor’s The High Sierra Peaks, Passes and Trails. There are two ways to go from Junction Meadow (mile 93.6) on the Kern River to the Roaring River Ranger Station (mile 139.0). The shorter option is shown as a purple line on the CalTopo map. The BSL follows the High Sierra Trail (HST) over Kaweah Gap, then connects with trail over Elizabeth Pass and down Deadman Canyon. This option is 45.4 miles. The shorter alternative, BSL with Colby Shortcut, crosses Colby Pass and descends Cloud Canyon. This option is about 20 miles, shortening the overall loop from 155 to 130 miles. Both options are very beautiful, and there is no obvious reason to choose one over the other in terms of scenery. There will be many hikers on the 30 miles of the primary routing that is concurrent with the HST, whereas the Colby Pass option is relatively lightly used. Clockwise or counter-clockwise both work, and there is no prefered direction in terms of scenery or logistics. In either direction, you begin at 5,000 feet and immediately climb to about 10,000 feet, so neither option has a kinder start. This initial climb is the toughest challenge on the route. Light packs will make this a lot easier. If hiking clockwise the permit for the Copper Creek Trail is relatively easy to obtain. If hiking counter-clockwise the permit for the Bubbs Creek Trail is harder to obtain. Hiking clockwise puts you on the JMT in a south-bound direction, which is the way most of the JMT crowds are traveling, so it will seem less crowded than if you are walking north-bound against the flow of traffic. Hiking clockwise also puts the junction with the Colby Pass shortcut at mile 94, so if you fall behind schedule you will have a way to shorten the trip. If you hike counter-clockwise, there is no reasonable way to shorten the trip and get back to your car after you pass the Woods Creek Trail junction. In an emergency you could exit via LeConte Canyon and Bishop Pass, but that puts you a very long way from your car. For this reason, hikers who are unsure of their pace or want to have the option of ending early would do better to hike clockwise. Finally, early in the season crossing the bridgeless river at Palisade Creek can be difficult; on the off-chance that wading is not safe and no log crossings can be found, it would be better to learn this sooner rather than later. If hiking clockwise and Palisade can not be crossed, retracing your steps back to Roads End is the only reasonable trail option to get out to the trailhead. If hiking counter-clockwise you could hike out via Bishop Pass to South Lake, ending up on the east side and far from your car or retrace your path south on the JMT to the Woods Creek Trail and take it out to Road’s End. There are two bailout trails that return to Roads End: Woods Creek Trail and Bubbs Creek Trail. These are located mid-trip whether hiking clockwise or counter-clockwise. We believe the best option is to start at Road’s End in Cedar Grove on the west side and complete the loop without stopping for resupply. Alternately, one could start at Onion Valley on the east side. Once you leave the road you have a long uninterrupted trip through wilderness. No part of the route is repeated. Permits for the Copper Creek Trail at Road’s End are relatively easy to obtain. Bear canisters are only required between Pinchot Pass (mile 52) and Forester Pass, (mile 80). This means that the food for the first third of the trip does not need to all fit into the can. Resupply: For those who choose to resupply, you would exit the BSL at Onion Valley and hitch to Independence, adding 14 additional miles of hiking. It might be possible to hire somebody to deliver a package to the Onion Valley trailhead or Kearsarge Pass. The availability of package delivery seems to change from year to year; if readers have information about this please add a comment. The wilderness experience is broken half way through the trip when you descend into Kings Canyon to cross the road at Road’s End. The half-day on either side of Road’s End is the least interesting part of the route and putting it in the middle of the trip breaks the spell. The seven mile leg from Onion Valley to the BSL must be hiked twice, adding about 14 miles to the trip. Onion Valley is one of the most popular trailheads on the east side and permits may be more difficult to obtain. Bear canisters are required from Onion Valley to Forester Pass which is the first leg, meaning that all your food must fit in the can. The main advantage of starting at Onion Valley is that there is easier access to the BSL for people who do not have a car. Fly, bus or train to Reno and take the ESTA bus between Reno and Independence; this bus runs 4 days per week. Then do the easy hitch or arrange a shuttle between Independence and Onion Valley. Reverse all of this to get home. Road’s End, on the other hand, is not served by public transit and the only reasonable way to get there if arriving in California by train, bus or plane is to rent a car. Resupply: For those who choose to resupply, it might be possible to send a package to an NPS office at Road’s End; if readers have information about this please add a comment. It is not an easy hitch to any town from Road’s End. There are variations that look plausible on a map, but all of these require off-trail navigation and are not appropriate for those wishing to stay on well-defined trails. Crossing the Great Western Divide via Shepherd Pass ->Junction Pass ->Center Basin. Secor describes Junction Pass: “Class 2. This is the original route of the John Muir Trail. It has not been maintained since 1932, but traces of the old trail are still visible…” Old maps show a trail over Junction Pass; the trail has been removed from modern maps. The abandoned trail is easy to follow north of Junction Pass; on the south side it is a horrendous talus field. Crossing the Great Western Divide via Harrison Pass -> East Creek. Secor describes Harrison Pass: “Class 2. Some maps show a trail over Harrison Pass. Be forewarned: This trail has not been maintained for many years, and the especially critical section of it leading up the north side of the pass has all but disappeared….” Indication of a trail has been removed from modern maps. Sixty Lakes Basin instead of Rae Lakes -> Arrowhead Lake ->Dollar Lake. There is a trail into and through part of the basin, but the off-trail route from the northern Sixty Lakes down to the JMT north of Baxter Creek requires picking a good line in order to avoid a steep drainage and some cliffs. There are at least three variations for this descent that go. Cartridge Pass -> Lake Basin -> abandoned Cartridge Creek Trail down to the Middle Fork Kings River. Secor says “This trail has not been maintained for more than fifty years – if it was ever maintained at all. This is an old sheep route which was once the route for the JMT, until the trail was constructed up Palisade Creek and over Mather Pass in 1938. The Cartridge Pass “Trail” is for all intents and purposes a difficult cross-country route.” The route from the South Fork Kings River into Lake Basin is not difficult for somebody with basic cross-country skills. However, the descent from Lake Basin to the Kings River requires careful choice of routes and is choked with vegetation in the lower reaches. This trail is shown on old maps, but has been removed from modern maps. From Simpson Meadow to Roads End via Kennedy Pass instead of via Granite Pass. This is still an official trail and is shown on current maps. The stretch from Pine Ridge to upper Kennedy Canyon had not been maintained when we last hiked it in 2012 and the tread is often obscure or obliterated. It is not a thrash, but it does require care and a good off-trail navigation sense in order to stay on the often missing trail. SEKI maintains an description of the condition of official park trails. Some of the routes listed above are not included, since they are no longer official trails. From the CalTopo view of the route, you can have fun switching to different map layers (control in upper right) and view historic USGS maps, dating back to the early 20th century. Gaia GPS on the iPhone offers access to these same historic USGS maps. Mike, What to do with your extra week? Return to a place you love, or pick out a new place on the map and explore; both are viable options and have value, so pick one and go! We try to write reports and assessments that give people a sense of what they can expect so each reader can decide if a destination would be appealing, but it’s up to you to decide what would be right. This is very helpful and a wonderful route. Thanks for all your efforts on this, much appreciated. I hiked a portion of this last August, in particular the section through Deadman Canyon and over Elizabeth Pass to Bearpaw and out the HST. The trail from the top of Elizabeth Pass going south has not been well maintained for the first 2 miles and is essentially none existent. Expect to do some route finding from just below the pass until the switchbacks about 1/2 mile before the intersection with Lone Pine creek. It is not difficult and all class 2 hiking. I recommend having a good topo of the area and a compass or GPS. The trail through Deadman Canyon is spectacular. I camped one night at Big Bird Lake which is 1/2 mile off of the trail about 2 miles before reaching Elizabeth Pass. Well worth the effort to get there! Mike, thanks for the added info about the trail conditions and Big Bird Lake. Holly, I am considering this as my first solo trip in sept. Would love to stay in touch and run into you on the trail! If you are in the women’s only JMT facebook group reach out to me would love to touch base! Holly – just one permit they are allocated by entry date and trailhead. Once you start the permit is good for the duration. Holly, I should add that when you get your permit they will ask for your nightly itinerary. However, unlike some destinations, this is simply to help NPS understand usage of regions and you are NOT restricted to camping in the zones stated on your permit. The only part of the permit that matters is entry date and trailhead. I think the best source for current conditions is http://www.highsierratopix.com/community/ and you should probably read any threads there about river crossings this extraordinary year. We take all of our Sierra trips in late August and September and can’t competently speak to river crossings in July of this record snowfall year. I certainly would not hike CCW this year in July assuming that it will be possible to cross Palisade. If there are no log bridges available it could be a dangerous crossing. If you hike CW you’d find out early in the trip. As to crossing the Kern via either the Colby Pass Trail or the High Sierra Trail, I recommend asking the NPS about conditions there. Thank you for an excellent write up of an amazing hike. Planning to do this loop in August to finish a portion of the JMT from last year, and to see the SEKI area too. Starting at Onion Valley so I can acclimatize well beforehand (I acclimatize slower than most people). FYI, for anybody considering starting at Onion Valley/Kearsarge Pass, I was able to confirm today that Cedar Grove Visitor Center is accepting resupply packages for the 2017 season, through Labor Day. They are located 6 miles from Road End near the Ranger Station. They recommended UPS (no USPS) shipping in a hard-sided bucket (critter proof). Pickup hours are 9am – 5pm 7 days a week. Bucket labeling: name, “hiker resupply”, pickup date, ship to: 108417 Westside Drive, Kings Canyon National Park, CA 93633. Their number is 559-565-3793. Great information. My husband and I are hiking the loop (counter clockwise-starting Road’s End) in August 2017 and are planning on 8 days. Does anyone have a breakdown of their trip with water sources/stops included? I want to hike with as little as possible and fill up along the way. Brittany, As you know, snow pack is well above normal, and all streams shown on the USGS map as seasonal or perennial should have water in August 2017. Brittany – if you want to hike with as little water as possible, have you considered the BeFree water filter? It allows you to very quickly and easily drink water to your fill, on-site at any water source, so you don’t have to ever carry water (assuming there are frequent water sources every hour or so). Compared to Sawyer filters and Aquamira solution, it’s easier and instant. Thank you so much for your information. I have my permit booked and am ready to go for mid-september clockwise. I am a bit apprehensive on how cold it will be at night, but getting my gear dialed down. I replied to your last comment before getting to the end. Where did you go/call for the permit? So excited for you! I was denied JMT this year and want to create a beautiful alternative adventure. https://www.nps.gov/seki/planyourvisit/upload/2017-Wilderness-Trip-Planner-Final-2.pdf page 15 has the application and the email to send it to. This is a great website and I find it very helpful. I’ve got a few questions and I seek advice. My gf and I are planning a JMT in late July – but it is looking quite unlikely as we were not successful in obtaining the permit. I have read quite a lot about walk-ups, but it seems the only walk up option is from Toulemne TH for Lyell canyon access point, and I am seriously considering SEKI as a great alternate journey. 1. We are not experienced hikers – certainly not someone who can hike 20 miles per day. Both of us are reasonably fit, but we do not hike much at all; multiple day hikes during national parks tour last summer (hiking up Angel Landing in Zion was probably the toughest hike) was about the extent of hiking we do. This would be our first big extended continuous hiking trip. To give an idea – we just returned from Yosemite where we did the Four Mile hiking trail in 5.5-6 hours (return), we found it strenuous and were sore for few days, but didn’t find it impossible. Given our experience, would the SEKI trail be something we can handle? Given the available bailout points such as Road’s end if we start from Onion valley or vice versa, I feel that this is doable, but I would like to know if I may be overestimating myself (my natural tendency is otherwise). 2. I understand direction and point of start depends on each hiker’s preference, but in my case, would it be better to start on Onion valley going clockwise – that way, if we need to exit early for whatever reason, we can take the shorter route via Colby pass, although this seems less traversed route, and this route gives an option to resupply in the Cedar Grove visitor station? Speaking of which, how long in advance should I mail my package? Anymore unsolicited tips/advice would be greatly appreciated. Thank you! Walter, I think the Big SEKI Loop is best for people who know they are comfortable gaining 4000 feet of elevation in a day, with a pack, and at altitude. Day after day. Based on what you said it doesn’t sound like this would be you. Perhaps try gaining that much altitude on your next day off work to see if you feel good that day and the following day. If you don’t have Mountains in your neighborhood you can always resort to climbing up and down the stairwell in a 10 story building x40. Thank you guys for your reply – yikes, it sounds like I’m trying to bite more than I can chew. Sounds like I’ll have to bite smaller – or just chew slower! Amy & James, thanks so much for laying out this route! My hiking partner and I ended up doing an abbreviated (10-day, 120 mile) version of this over the last two weeks (Devil’s Washbowl on the Copper Creek trail was deemed impassable by the permit issuer). I look forward to catching the rest of it another time! The Rae Lakes area, Glen and Colby Passes, Colby Lake, and Mt. Whitney of course were spectacular! A note to others coming from out East – the hiking there (except maybe in the Smokies and Whites) is not comparable in difficulty. We took our time and had a great hike. My husband and I attempted the loop starting August 11th (2017). We started at Roads End and intended to go counter clockwise through Elizabeth Pass. The Rangers told us immediately that Palisades creek was impassable and that we would not be able to cross there at all. So we headed on the route thinking that we would do the “1/2 loop” and cut back at Bubbs Creek. First day, the Bubbs Creek crossing was a little scary but we managed to find some logs to scramble over. By the time we went over Elizabeth pass and hit the high sierra trail, the crossing to get over to the lakes was also impassable. So we ended up at Bearpaw High Sierra camp and were told by another hiker that the crossing at Kern was also impassable. Suffice it to say our trip was cut very short! Ended up at the bottom of Sequoia and had to hitchhike back to our car! What an adventure! JP and Brittany – thanks to both of you for your comments. I just looked at the NPS Trails Conditions page, and as of 8/22/2017 they are still saying that the Palisade crossing is hazardous. The most recent update on the Kern crossing at Junction Meadow is dated 7/19 and as of that date they said they expected at least a month before that would be crossable. They also say they’ve had 4 drownings this year and I doubt they are overstating the hazard. Yes and we had said we didn’t want to be 5 and 6! It is hard to let go of your plans and/or ego and take a different route, especially when you have planned for so long and are carrying 10 days worth of food! But sometimes a different adventure awaits. We can’t control mother nature and I hope everyone stays safe out there! I emailed the ranger a few days ago and they said it is now passable (people have been passing) but it is between knee and thigh and swift moving. Hoping it will be improved for my start of mid September. Hello! Great site – thanks. I have been rejected for 4 days in the JMT lottery now, so looking for alternatives. If I get a permit from Road’s End and hike clockwise, would my permit allow for a side trip to Mt. Whitney? I did the High Sierra Trail a few years ago, but couldn’t summit Whitney due to a snow storm – so I would love the opportunity to try again. Thanks!! Thanks so much! I will look into that! If you have a wilderness permit from SEKI, no additional permit is required to add a Whitney summit to the loop. This is based on NPS Ranger input and my own experience of adding Whitney to my hike of the loop in 2018. Hi, thanks for the write-up. Is there any way to get to the Road’s End without a car? Stephen, The main advantage of starting at Onion Valley is that there is easier access to the BSL for people who do not have a car. Fly, bus or train to Reno and take the ESTA bus between Reno and Independence; this bus runs 4 days per week. Then do the easy hitch or arrange a shuttle between Independence and Onion Valley. Reverse all of this to get home. Road’s End, on the other hand, is not served by public transit and the only reasonable way to get there if arriving in California by train, bus or plane is to rent a car. You can hitch hike up there. I had to get a ride when the trail spit me out about 100 miles south of my car. It was relatively simple and people seemed used to it. Apparently it is done so frequently inside the park, it’s not illegal. That’s what two seperate Rangers told me anyway. Hitching to or from any of the east-side trailheads is easy. Hitching down the hill from a west-side trailhead is pretty easy too. However, hitching up the hill, starting for example at the airport or bus station in Fresno, is not so easy. The problem is that if you’re using public transit to get to Fresno you’ll need to start hitching in a more urban area, and that’s always harder than hitching in a more rural/recreation area. You can try hitching up from Fresno, I’m just saying that it won’t be as easy as hitching down to Fresno. I’ve often hitched up and down on the east side, and twice I’ve hitched down-hill on the west side. I’ve never actually tried hitching up-hill from the west side and maybe I’m wrong. If renting a car is not an option, you might be able to take a bus to Visalia, then take the Sequoia Park Shuttle to Sequoia NP, then hitch from Sequoia to Road’s End. Dermot, sorry we’re not familiar with the permit requirements for the itinerary you describe. In some instances the NPS/USFS allows you to re-enter within 24 hours using one permit, but that special arrangement might only apply to certain situations. Best to call them to find out. Got my permit to do this in July! Will be doing the clockwise route, and hitching to Independence from Onion Valley for a resupply on day 7. Decided to spent 17 days on this loop, with side trips to Onion Valley and to summit Mt. Whitney (didn’t get to do Whitney when I backpacked the HST a few years back because of a snowstorm). All in all, my route will be around 193 miles. Super excited. Thanks for all of the amazing information. This company offers supply drops and other horse related services. They will go to Roaring River. That isn’t the best resupply on the trip though unless you started somewhere other than Roads End. They may serve other areas. Do you have any sense of how much more difficult route finding might be on colby shortcut vs HST? And might one route be better if you like less alpine and more trees? Thanks for all your work, great info! I don’t recall offhand which route has a higher percentage of alpine versus trees, but a quick look at the CalTopo map using satellite imagery map type should give you the info you need to make that assessment. It’s quite difficult for us to answer your question about route finding because we don’t know your skills and comfort level. Both options follow designated NPS trails. However, there are stretches of trail that have not seen a trail maintenance crew in years and there may be places where a recent avalanche has dumped trees across the trail, or where shifting boulder fields mean you have to pick your way over rocks for periods of time, especially near the tops of passes. Sam and Barbara – thanks for letting us know that you hiked using the Colby alternative. Glad to hear you had a good trip. You can do Whitney from the west without a permit, I’ve done it twice that way now. Great website – I’m considering this hike rather than doing the JMT again next summer. Does the permit for this include Whitney (as a side hike) or is that separate? I believe it does not give access to Whitney, but am not sure. There’s thorough data about Whitney permits you can check. I’m on the trail now and don’t have time to help. This is the section of the trail that you encounter between Granite Pass and the JMT. While I didn’t find it to difficult to follow where the trail was supposed to be, I can attest, it was quite difficult to get across the washout. I found that the southern side was okay, but that the trail on the northern side was almost impossible to follow. I pushed my limited cross-country skills to their limits to get to the switchbacks that start at the highest crossing of the trail and Sphinx Creek. 3. To respond to a concern expressed in posts from previous years: Elizabeth Pass was lovely on both sides. While there was not much of a trail to follow on the Sequoia side, somebody had placed cairns beautifully to indicate the way to the pass. No problems on the Kings Canyon side. Quick question: you mention that there are numerous Class-2 peaks near the trail that are fairly easy. Are there any in particular that you would recommend? I did the route while recovering from an elbow injury sustained earlier in the summer, so I did my best to take it easy and avoid scrambles; but I hope to do the loop again next year, sans broken elbow. Thanks again for sharing your expertise on this website. This is one of the best hikes I have done, and I wouldn’t have known to do it without your posting! Sorry for the brief reply we wrote on Aug 20; we were on the trail without a keyboard. You asked about peaks near the route. We are hesitant to recommend anything in particular since we don’t know your skill level. That said, we have found that ANY peak on the SPS Peak list (http://www.climber.org/data/SierraPeaks.html) is worth climbing. That is a curated list. It’s not simply the highest peaks in the range, but a selection of peaks that has been deemed to be worth climbing. SummitPost.org has good descriptions of each peak and you can read descriptions of each peak near the route and decide which ones sound like they are right for you. Good luck, and enjoy the view from whatever peak you choose! Need advice. We received our permit at Roads End for entry into Copper Creek on 7/23/19. We are staying the night 7/22 at the Cedar Grove Lodge. Doing the Loop in 11 days ( taking Colby Pass ) back. Where do we park car? There is a National Park Service parking lot at the Copper Creek trailhead where you can leave your car for the duration of your hike. You can confirm this at the ranger station when you pick up your permit. Sometimes the NPS will have separate areas of parking lots for long term parking and other areas closer to picnic tables limited to day use, but the ranger or signs will make that clear. Comparing distances on CalTopo map and in the trip table, I’ve noticed difference about 10 miles (155 mi in the table, 145 on the CalTopo map) for the full loop and 8 miles for a loop with Colby shortcut, which could takes a day for a slower hiker. I’ve read the disclaimer, but still… Which distances would you say are more accurate? Konstantin – I recommend you use the distance chart, which is based on Trails Illustrated maps. The distances given in the CalTopo lines will depend on the resolution of the lines we created, the less resolution the lower the distance since small twists and turns and switchbacks get dropped. Alternately you could use the distances stated in RJ Secor’s book, which will be different from Trails Illustrated or NPS maps. And, if you use Gaia GPS on your phone and record a track while hiking you’ll get yet another variant on distance. It’s safe to say that our CalTopo lines will understate distance because we do not capture every switchback. I have a permit for BSL clockwise, start 2nd of june 2019. Do you have some information about temperature in the evening and night at this period, especially around 9 000 feet ? I’ve just finished a 4 days tramp south of new zealand with minus temperature in night, it was tough and i want to be well equipped ! Considering your distance chart, is it possible to make a fire at each stop ? Also, it seems to be a high snow season this year. What is the impact for crossing Palissad creek beginning of june ? Campfires are not permitted above 10k feet elevation so you could plan your stops accordingly. Palisade Creek will NOT be possible to wade. You may or may not be able to find a log crossing, not predictable because the storms dislodge and move them around. All high passes will be snow covered. You will need the skills and equipment for travel on snow, including steep inclines. There’s one article about the snowpack this year. There are better resources on snowpack, but I am on the road now without access to a computer. Early June always has potential for substantial snowpack, but this year in particular will be a problem. We recommend you call the ranger station to discuss your skill level and plan with them. Big SEKI Loop is in the general region called “Southern”. In particular you can pay attention to the stations in the following three river basin: Kings, Kaweah, Kern. As of today the Southern Sierra is at 151% of normal for this date.